The role of the scholar, the engaged scientist and the engaged citizen are compatible, complementary, and in fact necessary. 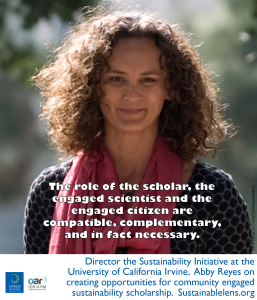 Director of the Sustainability Initiative at the University of California Irvine, Abby Reyes on creating opportunities for community engaged sustainability scholarship. We work to make community engaged sustainability scholarship integral to UC Irvine’s excellence as a research, teaching and service campus. We do that so our students, faculty and staff have the tools, training and resources they need to take bigger roles in addressing the critical sustainability challenges in our region and across the globe. We’re doing that because the University of California of which we are part has a drive, a purpose, to accelerate the shifts we need to see to decarbonise the university and accelerate the shifts in other areas of our lives to reorganise how we relate to the planet and each other. Re-imagining economy and tackling the big questions we face. Sustainability leadership training…new set of skills that we belive the rising generation of sustainability leaders need to be able to be the knowledge brokers…the interpersonal skills and mastery to work together across traditional divides on these cross-cutting issues where what can make or break progress is how well people relate to each other and how outside of our own positions we can move to get to our underlying interests which are more often than not common about what kind of future we want to see for our families and our extended communities and our planet. The approach we use is strategic questioning – a form of inquiry to enable young people to lead change processes in their community, from focussing on what’s concerning us most, through what do we want to see instead, through to what needs to change to get there, and then designing action for change. We’re living on the front lines of a changing climate. My mother raised us with an ethic of service and conservation. Service is the path to freedom, to liberation in the spiritual sense, closer one’s self. What we’re doing is offered in a gesture of creativity and joy and not a lot of attachment to the outcome. Very focussed on getting to our desired outcomes, but also not attached. Inside the classroom students are definitely understanding the scale and pace of the deterioration of our critical life support systems in the planet. Outside the classroom we build community, then we draw upon tools to express fear, emptiness, sorrow and anger about the state of the world, we allow that some airtime, because they’re not getting that in the classroom and because our way of relating with these issues through social media is online and solitary endeavour even though it has the illusion of being connected with others it is often ill-processed or partially processed at best. So we give that airtime, then help students see that the energy of anger is the same energy that drives passion. The same energy that drives emptiness is the energy that enables us to work with equanimity and the letting go. The same energy that drives fear, the flip side of it is hope. We help students go through that transition, then we get into what are you going to do about it? I developed the analysis that carries me today – the inextricable relationship between environmental and human rights. If we are working for protecting the earth, we also have to be working for protecting people. Scholars and communities together, enabling the shifts that we need. When we talk about creating circumstances for young people to be the knowledge brokers, I’m thinking “what does it take to unleash the capacity of more young people to go out into the world and stand with the truth?”. To stand in our knowledge of what it will take, right now, to transform our current systems and cultures of our industrial growth society into new systems and cultures of a life sustaining society. That is an unprecedented agenda, and it is one that is squarely on the shoulders of young people. We train the workforce, and the more they have a sensibility of their place in the larger scheme of things, the more likely they are to place themselves in their organisations to step up and make transformational shifts. We create circumstances to light the light about the roles people take. We’re teaching people to look for windows of opportunity. Academic freedom for faculty, but all students in both curriculum and co-curriculum. Rolling this out 250,000 students is new, and people are excited by it, taking it to scale. What does it take to awaken that conversation for all 29,000 students on our campus? (Sustainability at UCI…) has a long legacy…scientists here found the ozone hole, and went beyond their science to make sure it was addressed. Our purpose…community engaged sustainability scholarship integral to UC Irvine’s excellence as a research, teaching and service campus…what this means to us is engages our students, faculty and staff in the understanding that the role of the scholar, the engaged scientist and the engaged citizen are compatible, complementary, and in fact necessary. Resilience…is not an effort of bouncing back, but bouncing forward. The key elements are not only mitigation and adaptation, but also deep democracy. The story we tell is simple: eco means home; ecosystems are relationships of home; ecology is our study of home, our knowledge of our relationships of home; economy is our management of home; our economy our way of managing should reflect our knowledge of our relationships of home; our fundamental relationships of home are interdependence; it is time for our economy to reflect our interdependence; it is time for us to do the work of releaving humanity back into the web of life; that means a lot of creative work to create new systems and cultures of a life sustaining society. The American Dream is being constantly redefined. The version with the white picket fence and every man has his castle didn’t turn out to work for many people at all. The coyote trickster beauty of this moment of ecological transition is that we are talking about distributed power, we’re talking about people coming together to figure out their waste management and their food production, and their water gathering and energy storage, and when communities need to reorganise in this way then they need to know each other, they need to talk with each other, get in each others’ business and this is where the personal mastery comes in. It needs a spectrum of strengths: people work to change the systems and cultures of industrialised growth society through actions like service, resistance, governance and reform, and people also dedicate themselves to create new cultures of life sustaining society. Transformation happens over time, and the most effective communities I have seen have people working all parts of the spectrum of strengths and knowing their location on that spectrum and that of other…so people aren’t working in isolation. It is not my place to answer if what we are doing is radical enough, we do the training to set up young people to know how to ask the questions. (Success?) We’re in the middle of the process, successes are around conversations. Some high points of success, Obama speaking about sustainability and climate change at UCI, the Dalai Lama. (Activist?) I’m a life-long activist. There are ways to walk in the world, characterised by action, without a stickiness around the outcome. Doing this work from a place of joy and integrity so that we can be here for the long-haul no matter what the long-haul brings. Our understanding is that if we do this work right now, we are developing the strengths of relationships and of inter-being that we will need to call on later if and when systems move towards collapse. (Motivation?) I am here on this planet, I am alive, I am lucky enough not to have had my life taken already, there are plenty of people who are similarly motivated whose lives have been taken – if I’m still here the only work worth doing is work that enables people to have the space to life in freedom and live in the right relationships with each other and the earth. (Challenge?) (UCI has set…) aggressive targets with lots of moving parts. But if we do it right it could be the blueprint for how to do it nationally and internationally. How to integrate South and North. Deepening students’ understanding of interdependence. (Miracle?) Authentic engaged dialogue with communities. The shift I’m most interested in is what happens when we do the hard work to build communities right where we are to accelerate the shifts we need to see. (Advice?) The perspective I would invite listeners to entertain is how would your life be different if you truly believed you belonged in the web of life, and how would your actions be different if you saw you had a critical role in the web of life to weave humanity back in.